There are games that are best seen at a size bigger than a telephone. Mikado Defenders, Taito's lovely but prickly iPod Touch and iPhone tower defense game is one of them. Gamers would best play this beauty place-mat scale. Mikado Defenders is another tower defense video game, the last thing a world of gamers satisfied with their bellyful of Fieldrunners, PixelJunk Monsters, Desktop Tower Defense and so many more need to read. Oh, but it is about Shogun warriors in old Japan and looks like it was painted on parchment. That's a reason to be intrigued. A reason to part with three bucks. A reason to brace yourself for fun mixed with aggravation. A reason, not quite, to get an iPad? TD With A Twist: The game's appeal is not its Okami-good looks, which are compromised by the primitive animation of the little warriors that scurry across Mikado Defenders' battlefields. It is its take on tower defense, which felt fresh to this veteran of the genre. The game puts the player in control of one of five Japanese battlefields, each pocked with locations where armies can be placed and each with a gated base of operations. Demon enemies walk and fly toward that base unless your defenses can stop them. The twist is that the base — not just the armies — can be upgraded. The money the player earns from successful kills can be spent after every handful of enemy waves on better base walls, better bases, and projectile defenses on that base. In addition, the player can embed upgradable, unlockable military commanders to improve a unit's strength as well as summon spirits for powerful but infrequent super-attacks. These added variables make the game quite the puzzle to sort through as you wonder just which techniques can stop the horde. Should you upgrade armies? Rely on commanders? Bolster the base? Built For Superman Eyes And Baby Fingers: Mikado Defenders might be ruined by being too small. The density of detail in the game is scrunched too small on an iPhone or iPod Touch, and the purely touch-based control is foiled by anyone who has fingertips bigger that are broader than the end of a Q-tip. Only when I tried playing this game on the comic-book-sized iPad did I feel I had both a clear view of the game's busy action and the comfort and confidence to tap my forces into the arrangements I wanted them to be in. If you have an iPad, consider this paragraph colored blue with happiness. But if you have an iPhone or iPod only, it ought to be red with dismay. Needs To Be Paved: Mikado Defenders doesn't have a difficulty curve; it has difficulty potholes. An inadequate help menu, a fuzzy explanation of how money is best earned and how commanders level up — plus a lack of any visual cues as to the health of any of your forces — makes this game too close to being indecipherable, too reliant on trial, error and the Googling of terms, to win any awards for intuitive gameplay. I guess it was a bad sign that the game's support page on iTunes links to a Japanese webpage. Mikado Defenders is a good game if you have the right hardware, microsopic vision, tiny hands and/or friends who will help you untangle its mysteries. Surmount those hurdles and you'll have fun. Otherwise, well, test the Lite version on iTunes first. 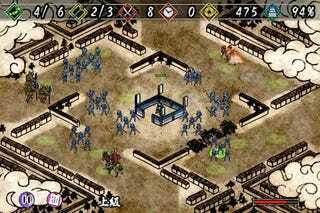 Mikado Defenders was developed by Taito and published by SquareEnix Taito for the iPhone and iPod Touch on April 19. Retails for $2.99 USD. A copy of the game was given to us by the publisher for reviewing purposes. Played through the game's five maps; mostly on normal difficulty. Took me a long, long time to figure out how to unlock any new commanders. Good luck figuring it out..